Vince Gill’s song “Look at Us” is about the joys of a long relationship, something Hesperia residents Bill and Wanda Eversole know a thing or two about. The Eversoles will sing “Look at Us” in the fifth annual High Desert Senior Talent Showcase at the Victor Valley College Performing Arts Center today. Bill Eversole, 82, and Wanda Eversole, 77, have been married for 63 years. They met while Bill Eversole was in the Marine Corps. One look was all it took, he said. They have performed as a duo in all the previous senior talent shows except one, when Bill Eversole performed alone. “It’s so good to have her join me,” Bill Eversole said. “I couldn’t ask for better companionship, and when you talk about soul mates, that’s what it is.” Bill Eversole has been singing since he was 6 years old. He writes music and plays guitar. Wanda Eversole has 35 years of professional experience in various forms of dance, such as square dancing, Tahitian dance and clogging. She has also been teaching line dancing in Hesperia for 15 years. The couple said they are not nervous about the talent show, as they do performances throughout the year in front of crowds, performing karaoke every first Saturday of the month and singing at other venues. “Music is something that really enlightens the soul and when you use it, it’s a beautiful thing,” Bill Eversole said. The show will feature 27 acts put on by roughly 130 senior citizens ages 50 to 92, showcasing their skills in dancing, singing, playing instruments and more. The show begins at 2 p.m. and admission is free. Heritage Victor Valley Medical Group and St. Joseph Health, St. Mary are sponsoring the event. 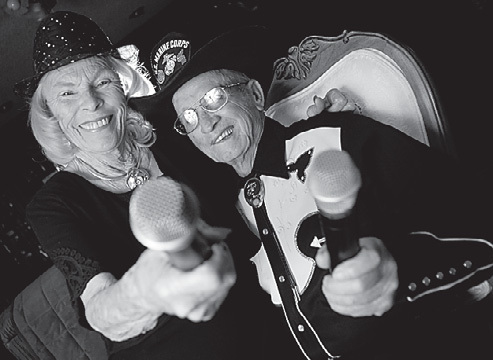 JAMES QUIGG, DAILY PRESS CLASS ACT: Wanda and Bill Eversole will be performing several different acts during the fifth annual High Desert Senior Talent Showcase today at the Victor Valley College Performing Arts Center. The couple will sing together and Wanda will perform dance acts.